On January 2nd of 02007 Stewart Brand and I stepped into the cool deep past and unknown future of who begat who. Since I began working on the 10,000 Year Clock project, and associated Library projects here at Long Now almost a decade ago, I have heard cryptic references to this archive. We have visited the nuclear waste repositories, historical sites, and many other long term structures to look for inspiration. However we had never found a way to see this facility. 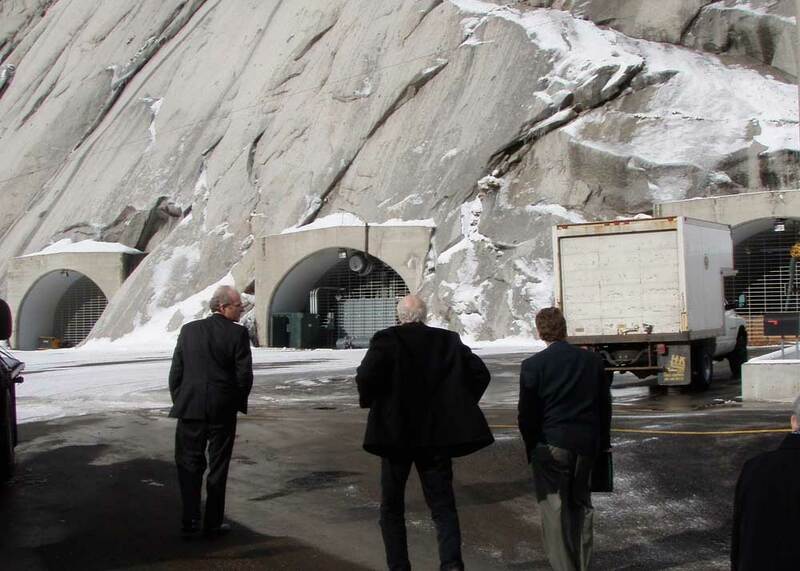 This is the underground bunker where the Mormons keep their genealogical backup data, deep in the solid granite cliffs of Little Cottonwood Canyon, outside Salt Lake City. UT. The Church has been collecting genealogical data from all the sources it can get its hands on, from all over the world, for over 100 years. They have become the largest such repository, and the data itself is open to anyone who uses their website, or comes to their buildings in downtown Salt Lake City. However they dont do public tours of the Granite Vaults where all the original microfilm is kept for security and preservation reasons. Since Stewart had recently given a talk at Brigam Young University we were able to request access, and the Church graciously took us out to lunch and gave us a tour. The largest contaminate of their microfilm we were told was in fact blue jean lint brought in by the workers :) They use microfilm mainly because there is not a longer lasting digital equivalent. However they are digitizing their holdings and collecting more and more digitally for dissemination. Once getting buzzed through the gate our first question came up… Why doesn’t anyone park near the entrance? It turns out that boulders occasionally cleave off the rock face above from the freezing and thawing of water in the cracks of the rock. These boulders then come down the cliff and crush peoples cars. Our first lesson was learned for a space we might build into solid rock: anything under a rock cliff is on borrowed time. We were asked not take pictures beyond this point. Once safely inside it looked like just about any other office building really. The only thing giving away the strangeness was the curved corrugated metal ceiling and walls. I asked what the design life for the archive was; “1000 years” was the answer. The facility was built in the 60’s (likely a product of cold war fear) so it is now about 45 years into its intended design life. About sixty full time workers bustled about with microfilm and scanning in this front lateral tunnel near the daylight. Past that point we stepped through double doors, and a large bank vault style door, into one of the 750 foot long tunnels going back into the archives. These are all connected by lateral tunnels holding impossibly long rows of skinny microfilm drawers. The infinite repetition and forced perspective reminded me of the “we need lots of guns” scene from the matrix. Each drawer is numbered with a simple set of digits, the film number, given in order of collection. Stewart asked how it was indexed… “in an Oracle database” said the lead archivist. “I wonder if they will be around in 950 years,” I said. The real highlight of the tour was the reservoir. 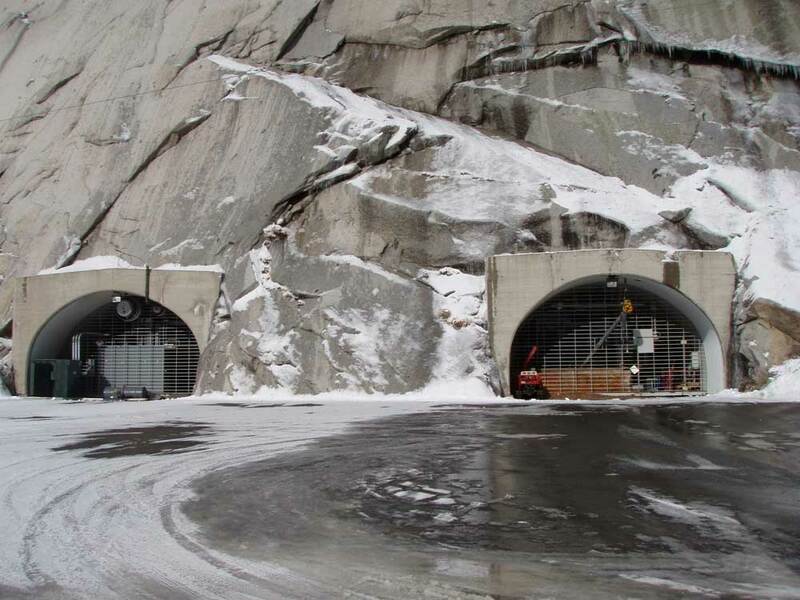 In the deepest tunnel, through a door, was the only part of the facility where you could see exposed rock. A small cement wall is built up here to trap the water dripping from the micro cracks in the rock above. The narrow long hallway filled with water from a slow drip reminded me of the Fremen water caches of Frank Herbert’s Dune. They gave us a cup of the water, tasty. At the end we got to ask all kinds of questions about the facility and how it has been working. They said they have already had to relieve water pressure under the floors and walls, and allow it to drain. This was the other big lesson: dont think you can keep the water out, it’s far better to accept it will come through, and just route it. We also saw their giant air movers. It was a huge energy expenditure to keep it all ventilated… for our project we would need to make it naturally venting. It was one of our most useful tours of an underground space to date. The Church could not have been more helpful and open. I came expecting it all to be very cryptic and weird, and left feeling as though we had at the very least, new allies in the long term.